have arch support are only recommended for those who absolutely need to wear them, as they will interfere with the flat/ball use of the feet in belly dancing. No. Belly dancers come in all shapes and sizes. If you are worried about your weight, check with your doctor and get his/her permission to start a belly dance exercise routine. Belly dance provides a great workout for everyone. Do not wait till you are your ideal weight to start. You will learn to love your body and yourself soon after you start classes and belly dancing will help you to get in shape! 6. Do I need to lose weight before dancing in a recital or performing? thin. Plus the right costume is like Magic - and there are many styles to choose from including those with tummy net covers and gorgeous Beledi dresses that are like evening gowns! This dance is a very ancient art form whose exact origin was not recorded, although it is believed it has roots in matriarchal goddess religions. The earliest recorded dances were fertility dances for blessing the land and encouraged both the growth of crops and babies. The dance prepared a woman to be a mother as well as recover from the stress of childbirth and caring for a newborn. The dance is originally believed to have come from Asyria or Egypt and eventually spread throughout North Africa, the Middle East, Mediterranean, and parts of Asia through the trade routes such as the Silk Road. 8. I have back problems and want to learn belly dance. What should I do? and more severe cases find it an excellent way to manage pain without the use of harmful drugs. It is always recommended that you check with your doctor first before beginning any exercise program. 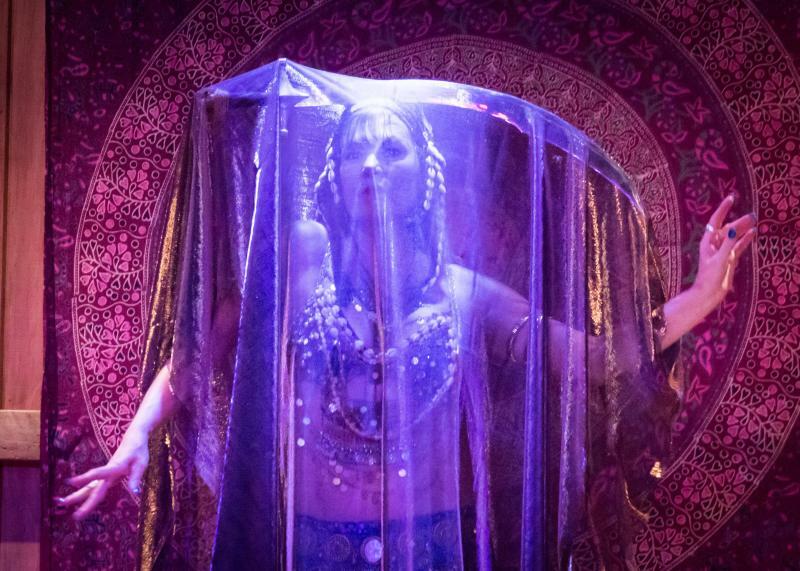 You do not have to be Middle Eastern to learn to belly dance. You do not have to have any experience in order to learn the dance. Miramar includes cultural information in her classes and can answer your questions about most aspects of the dance and/or culture. Just ask! Credits are only given when a student must quit taking classes due to severe illness or injury and is not able to return to class. A doctor's written note stating such is required. To receive credit, you need to notify Miramar within one week of your illness or injury and send a doctor's written note no less than two weeks after your illness or injury. for group classes. Letter of Credit may not be used for private lessons or workshops, haflas, or other special classes. most classes/courses do not offer make-up classes at all. refundable. You should understand that you are registered for a certain set of dates and that if you miss a class that there are no make-ups unless covered by the Make-Up Policy. Students who are not able to attend class on a regular basis should pay the drop-in prices for classes if that option is available. cancellation is promptly sent out. know-how, stamina to perform for 20-30 minutes without getting winded, and the list goes on and on! 17. I want to teach belly dancing. How long will that take and what are the requirements? Greek, Moroccan, and the many various forms of folklore. A musical ability is an absolute must as you must be able to locate the first beat of a phrase (something that many students seem to have trouble with) and break down music. An ability to dance by improvisation and choreography is a needed requirement and you must be able to choreography suitable dances for your various student's abilities. 18. Why do you require full-time attendance for your intermediate-advanced level classes? YouTube Instruction is provided for FREE for full-time enrolled students. In order to receive the private videos you need to set up a Google Profile e-mail account that you will use to log into YouTube. If you drop out of class it is possible to continue with YouTube support for a low fee of $20 per month provided you meet certain criteria. Please enquire. If you quit class and do not continue with the YouTube support you will be deleted from the private videos. If you rejoin the class there is a $50 fee to add you back to the private videos as this takes a lot of time and effort. PLEASE BE ON TIME: It is important for you to participate in the needed warm-up exercises. If you will be arriving late, please enter the room quietly and position yourself. Take a moment to stretch lightly, especially warming up your neck, back and ankles. 1. Conduct yourself as you would in any classroom setting. Questions pertaining to the material being taught are welcome - please ask! Questions not pertaining to class material should be e-mailed to Miramar or asked at a different time. If you do not agree with something that I am doing or requesting in class, please talk with me about this before or after class and not in class. Joking and laughing are encouraged – the class is supposed to be fun! 2. Please resist the urge to answer other student's questions. Your approach or answer may be different from the point the instructor is trying to make. 5. Cell phones should be turned off while in the classroom. Please make any needed calls outside the classroom. 6. Please try not to chew gum while in class. Facial expressions are an important part of Mid-Eastern dance! basics is a very good idea, good for your technique and your body! 8. Understand that most everyone is attending class at least partly for stress relief, so positive attitudes help! 9. The studio can not accommodate children, husband, boyfriends and/or pets. 10. Please remove your street shoes before entering the dance room. 11. Please take your empty water bottles home – this cuts down on clean-up. Still have questions? Please contact Miramar. She looks forward to hearing from you.